Packed with some of the most famous road cars, racing cars, motorcycles and even aircraft, the 2014 Goodwood Festival of Speed has been just as impressive as ever. We’ve picked out some of our highlights from various different categories for the gallery below. Click here to visit our Goodwood homepage. Just 30 examples of the ‘long tail’ Alfa Romeo Giulietta Sport Zagato (SZ) Coda Tronca were built, so it’s an exceptionally rare car. Not only that but it’s an exceptionally rare honour to drive one, not least up the famous Goodwood hill climb. Nonetheless out very own Managing Editor, Dan Powell, got to do just that. Power comes from a 1300cc four cylinder engine, which isn’t the most powerful in the world at 135PS – but light weight and excellent aerodynamics courtesy of the Coda Tronca bodywork make for a swift car. 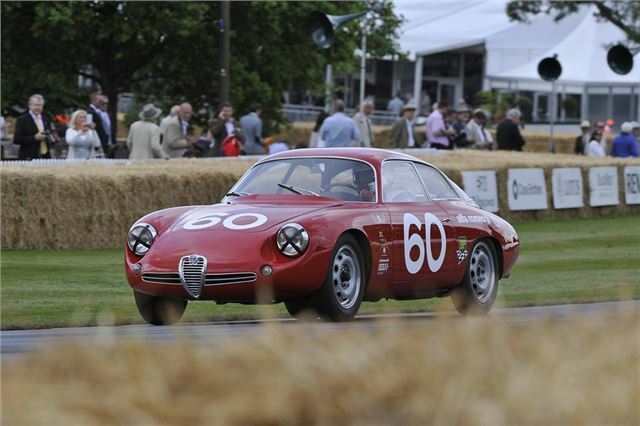 The Giulietta SZ Coda Tronca is widely regarded as the finest Alfa Giulietta ever sold.